Sometimes good things come in horrible packages. I don’t seem to recall any motivational poster with the statement above, but that doesn’t make it any less true. On its own, a really good messenger app. It could use a some usability love (Do you really need to confirm every time I wish to end a chat? ),but the UI is clean, and the push infrastructure is superb. Problem is, it’s stuck in the glorified pagers called Blackberry phones. No point going into why I don’t like Blackberry’s. We don’t even have to fight about it. Let’s just agree to disagree, by which I mean, some people enjoy things that reset themselves and have looked exactly the same for 4 years, and I –on the hand– have tech taste. 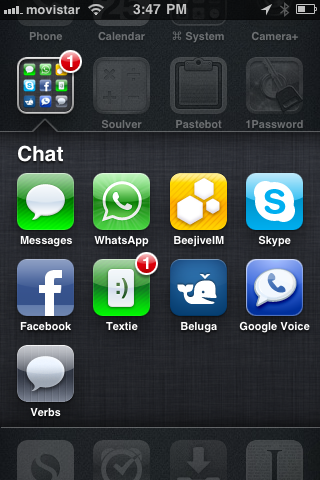 Believe I have tried alternatives: WhatsApp, GoogleTalk, Textie, Beluga, Kik, etc, etc. My pal Nav has tolerated every new app invitation I’ve sent him. But all of them loose to Blackberry, because they need the user base to grow in other platforms. The only one that managed to be useful for a while was called Chirpy. It basically was a Twitter Direct Messages chat App. If your friends had Twitter (and most of mine do), they will get it as a DM. Problem solved? Not quite. In part because Twitter DM are as unsafe as loggin into Facebook on a public WiFi. So here is my one and only feature request for Twitter (now that Tweetie 2 is out), develop a new type of DM that is encrypted end-to-end. You can read it, I don’t care, but have the message itself be secure from my device to your server, and from your server to the other person. Make it so that only one device is authorized to read the messages, and -this is important- you can’t read these SDM from http://twitter.com/. That’s all I ask. Trust me, if I tell my friends and relatives this is the last type of messaging app I’ll tell them to install (and most won’t, since they already use Twitter), they’ll gladly do it just to make me stop bothering them. It’s a win-win-win: I can flirt from my iDevice of choice, you become even bigger because people will now perceive you’re secure (they don’t, but that’s another post), and tasteless persons can continue to use Blackberry.